Our Christmas stuff is up! Finally! I am SO excited. We’ve been holding off because we were having a good chunk of the place painted last week and didn’t want to have the holiday decorations taking over. But now the painting is finished and it’s full-on Christmas mode in the Liv for Cake household. Our stack of holiday movies has been unpacked, dusted off, and neatly piled in our tv room so we can start making our way through our favourites. We have a few movies that we watch every year on specific days, because we’re crazy like that. The Holiday (my absolute fave) usually kicks off the first night of Christmas break, and National Lampoon’s Christmas Vacation gets watched twice — the night we put the tree up (which is usually mid-November) and again on Christmas Eve. It’s a classic! Some of our holiday movies don’t get as much love as they deserve. Remember all those stop motion ones when we were growing up? Rudolph The Red-Nosed Reindeer, Santa Claus Is Coming to Town, etc. All of those are in our collection, but we almost never watch them. They’re just not the same for some reason. And why does Rudolph seem so epically LONG these days? I’ve tried to watch it, but it’s like never-ending. Old classics like It’s a Wonderful Life, White Christmas, and Holiday Inn rarely get watched as well, but I love having them in our collection. A recent new fave of ours is Arthur Christmas — super cute and fun! And another less-known fave of mine is While You Were Sleeping (does anyone know that one??). It’s totally cheesy, but I love a good Sandra Bullock movie. And, of course, no Christmas is complete without at least one viewing of Mickey’s Christmas Carol and the various holiday Disney shorts. Wow, I’ve rambled on for 4 paragraphs about Christmas movies. Don’t even get me started on our Christmas decorations. That’s a whole post unto itself. Alright, this is it. 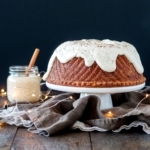 This Eggnog Cake is my last eggnog recipe of the season. Are you sick of them yet? Totally understand if you might be, but for some reason I was on an eggnog kick this year. I go through phases with stuff, and I guess this year it was eggnog’s turn. 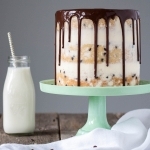 I love the naked cake style, and if you’ve been following Liv for Cake for a while, you know that I love a drippy ganache! White chocolate is actually not my favourite, so this is my first time using it in a ganache, but I think it worked great on this Eggnog Cake. In hindsight, I maybe should have tried making the ganache with eggnog instead of cream (duh). Not totally sure how if would work, but I’m thinking it would be ok and add some extra flavour — in case you’d like to amp up the eggnog even more, it’s something you could try. Also, I forgot to put nutmeg in the frosting (lol). I fully intended to, as it pairs so well with eggnog (there is nutmeg in the cake), but I was in a rush (as usual) and I thought that I didn’t need to grab my recipe notebook because the frosting was the same as I’d used on the Gingerbread Cake from last week. Except that after I put the cake together, I realized that I specifically wanted to make the frosting a bit different and add nutmeg to it (sigh). Oh well! It’s delicious as-is, but a bit more nutmeg couldn’t hurt, should you feel inclined to add some. 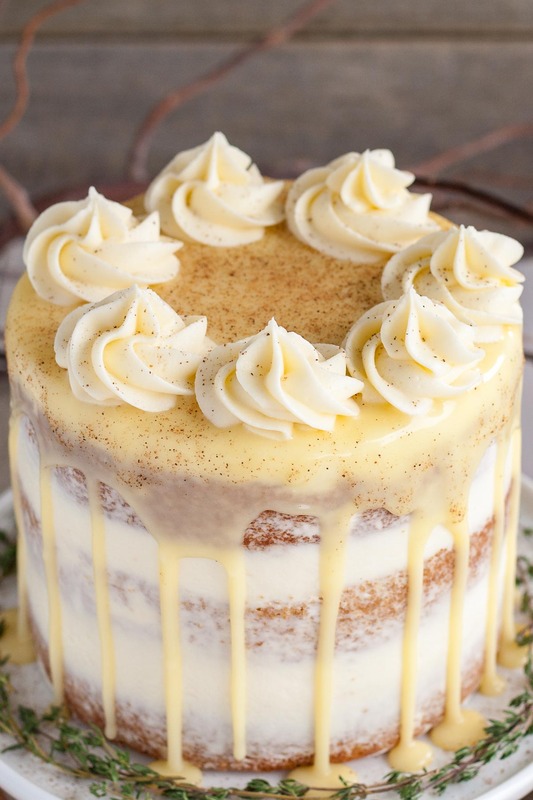 I am really happy with how this Eggnog Cake turned out! It is delicious and looks better than I thought it would, which almost never happens. 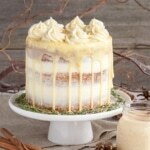 The eggnog flavour really comes through, and the sweet cake pairs really well with the tangy cream cheese frosting. The white chocolate ganache adds both flavour and flair. 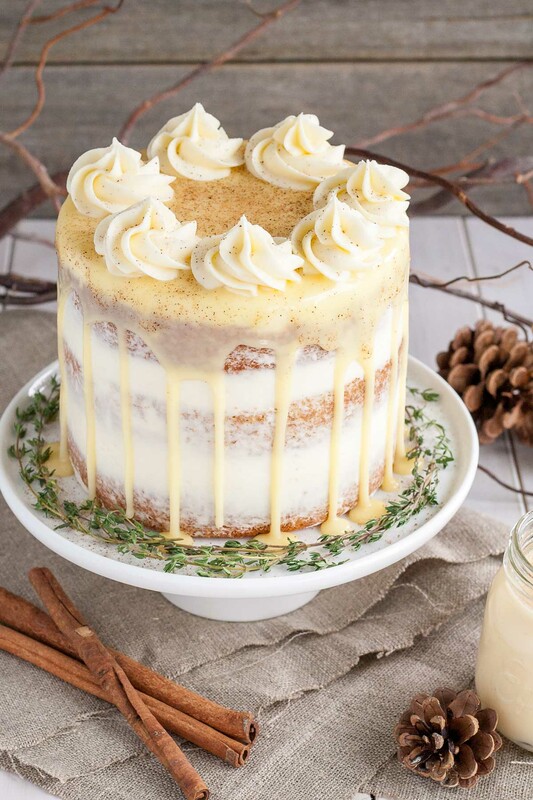 A perfect cake for the holiday season! You can leave the rum out or replace it with vanilla if you’d like a kid friendly cake. I forgot to include the nutmeg in my frosting but had intended to have it in there! If the ganache is too thick (mine was a bit), add in a tsp of heavy cream until it gets to a thin enough consistency. You will have some rum simple syrup leftover. You can use this to sweeten/spike cocktails or hot beverages like coffee or hot chocolate. In a medium bowl, whisk flour, baking powder, nutmeg, cinnamon, and salt. Set aside. Using a stand mixer fitted with the paddle attachment, beat butter until smooth. Add sugars and beat on med-high until pale and fluffy (2-3mins). Bake for approx. 25-30mins or until a toothpick inserted into the center comes out mostly clean. Place cakes on wire rack to cool for 10mins then turn out onto wire rack. Poke holes into the warm cakes and brush with some of the cooled rum simple syrup to moisten them***. Allow cakes to cool completely. Place sugar and water into a small saucepan and cook over high heat until simmering and sugar is dissolved. Remove from heat and stir in rum. Allow to cool slightly before using on cake. Beat butter and cream cheese until fluffy (2 mins). Add powdered sugar one cup at a time. Add vanilla & nutmeg and beat until fluffy (3 mins). Place chopped chocolate and cream into a microwave safe bowl. Stir to combine. Microwave for 20 seconds, stir. Microwave in 10 second intervals, stirring in between, until smooth and silky. Set aside to cool and thicken slightly before using on cake. Place one layer of cake on a cake stand or serving plate. Top with 2/3 cup of frosting. Repeat with remaining layers and apply a thin coat of frosting all over the cake. Use a bench scraper to smooth the sides. Chill for 20mins. Using a teaspoon, drip ganache along the edges then fill in the top and smooth. Chill for 15mins. Sprinkle with nutmeg and top with rosettes if desired I used Wilton Tip 1M. * I forgot to include the nutmeg in my frosting but had intended to have it in there! ** If the ganache is too thick (mine was a bit), add in a tsp of heavy cream until it gets to a thin enough consistency. *** You will have some rum simple syrup leftover. You can use this to sweeten/spike cocktails or hot beverages like coffee or hot chocolate. I love this cake! 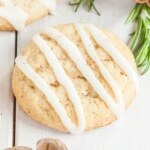 I baked it for Christmas and it was a huge hit–great recipe! I don’t think my layers rose very well, however, as they were a bit dense. Do you have any suggestions for techniques to ensure good rising? Also, do you recommend any books that cover the technical/sciencey aspects of the ingredients and which would help with troubleshooting and better understanding baking? I made this cake for New Years Eve and it was wonderful! I did use eggnog in place of the cream in the ganache. Hi Pam! So glad you liked it and that you tried the eggnog in the ganache! I made the cake with Bob’s Red Mill gluten free flour. I also used Lactaid Egg Nog. The cake turned out delicious. I also crushed a candy cane and sprinkled on the ganache. Very pretty on the white frosting and tasty. Hi Luann! Thanks so much for the tips. Glad it turned out! Do I need to adjust this recipe for high altitude? If I were to make this for 3 9” layers, how much should I increase the recipe by? Thanks! I have spiced rum instead of plain rum. Will that work? HI Taneatha! Yes, that should work fine! I’ve read all the comments and I do not have the 6″ tins but can sub the 2 9″ and will double the recipe. My question is will I be ok to not double the syrup – it seems like you said there would be extra of that. The ganache is for the top so maybe don’t double that? But guessing I should double the cream cheese icing? What would be your suggestion? Hi Liv. 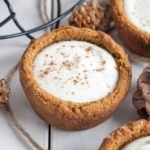 Did you use Homemade eggnog in this recipe? Hi Sidonie! No, I used store-bought. Made this cake last week and it was delicious! I have eggnog extract, so I added that to the batter and the frosting to amp up the eggnog effect. I omitted the rum simple syrup due to it being a work function, but I bet that addition would have been extra delicious and the simple syrup would have upped the moistness factor. Still, I’m grateful the cake was not dry without it. Excellent flavor. Hi Raven! Thanks so much for the feedback, I’m so happy that you liked it! How would you adjust the cooking time on this for cupcakes. Also, these will be for kids, do you suggest I use rum extract instead or just skip the syrup? When making the rum syrup, does the alcohol dissolve while cooking? I don’t drink, but would love the flavor! Hi, I have a gas oven and my cakes aren’t rising like they did in an electric oven. Any idea how to change that? Hi Courtney! Do you have an oven thermometer? Maybe your oven runs a bit on the cooler side. I would test that first! Hi Marie! I hope you like it 🙂 I think that should work fine. It will change the texture of the cake a bit, but if you prefer oil to butter I would certainly give it a try. Quick question! 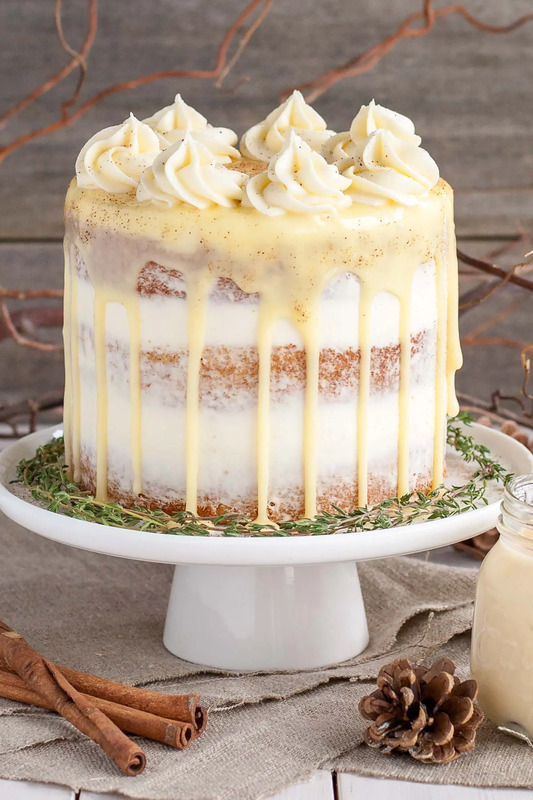 I want to make this cake for Wednesday night so if I made it Tuesday night and refrigerated it without adding the ganache and frosting dolops would that be ok? Then right before heading out I could add the ganache and rest of the frosting? Hi Yolanda! Yes, that should work fine! I don’t know if you’ll see this, but I’m baking the cakes a few days early and freezing them so I can finish it for work- schedule wise I just won’t have the time to make the whole thing the day before I need to bring it in- do you recommend waiting to do the syrup before freezing or after? Hi Leigh! I would do the syrup during cake assembly. Let me know how you like it! The cake is light and moist, and full of flavor.. I used Alton Brown’s aged eggnog recipe.. turned out real great! 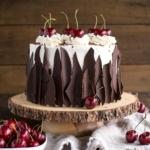 Will try a few other frostings, as i find it a bit sweet… reducing the sugar would most likely lessen the sweetness.. will try it with Italian Buttercream… Great recipe! Thank you! I just ran across this recipe and would like to make this for Christmas this year. My question before I experiment is….can I double the recipe to make a larger 9″ cake? Hi Mary! Converting pan sizes is always tricky. 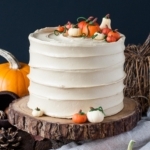 Here’s a site I use as a guideline: http://www.joyofbaking.com/PanSizes.html I think doubled would work well for three 8″ layers. Rating is for the cake portion – just divine. 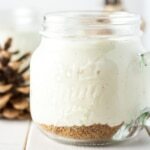 Such a great eggnog flavor, nice and fluffy, and the recipe is simple. I used two 7″ rounds and they came out perfect. 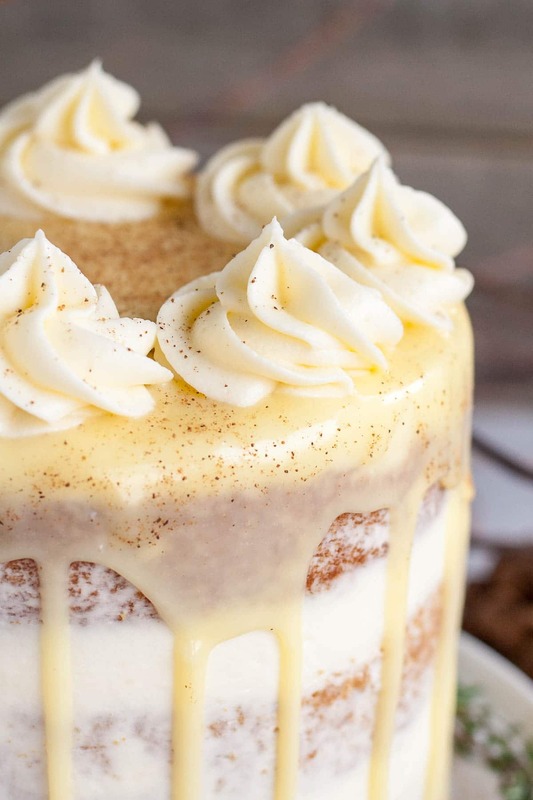 Diverged from the recipe by brushing with rumchata liqueur and frosted with a rumchata cream cheese frosting. Yay boozy cakes! Hi Stephanie! So glad you liked this recipe! I love the addition of rumchata, I’ll have to give that a try! Two Qs about the rum simple syrup. If I sub vanilla do I use the same amount? It seems you brush it on once the cakes are turned out onto the racks. I’m assuming you don’t want to put so much on that it begins to drip through. Do you have any tips for knowing how much is the right amount? Thanks for the help and great recipe! I can’t wait to display and taste this on Christmas day! Hi Ellen! You’ve probably already finished and served the cake, but I’m going to reply anyhow! You can use vanilla instead – it’s more concentrated so I’d use 1-2 tsps instead. As for how much to use, it’s not an exact science. I’d say I probably use 2-3 Tbsp of syrup on each layer. I hope you liked it! Agh. I hate myself. I just cut the cake. It’s moist on the inside. Only sweet parts are the areas where the simple syrup hit ( I caved and made it). All that to say, I now have to do it over anyway to end up right back here. Why didn’t I trust myself? I adjust the recipes ALL the time and they never fail. Why oh why did I think today was special? Sigh 😔. I have no time for this madness. I made 2 of these cakes for Christmas this year and the cakes came out great but for some reason my Cream Cheese frosting didn’t come out it was really runny. I used the exact measurements I’m wondering if I should have used the whisk attachment to my mixer or the paddle. Do you have a suggestion? Hi Dominique! It sounds like maybe your butter and cream cheese were a bit too soft. Or maybe you mixed them for too long? You can try putting the frosting in the fridge for 20mins then whipping again to see if it firms up, or adding more powdered sugar to stiffen it (though that will make it more sweet too). I use the paddle by the way! I’m sitting here thinking, I need to make a cake for Christmas because last Christmas I got into it with the lady I ordered cakes from for 8 straight years some 3-5times per year. I head straight to the Ferrero Rocher link, click on the menu and look for my inspiration. What do you know? I came up empty handed. So I go back to Pinterest and search, “Christmas cakes.” There! in the signature “Liv for cakes” font I found it. Yeah! Eggnog is all most people want for Christmas anyway so this is golden. I abandoned braiding the girls hair- I’ll pay for that two fold as they’re hair will tangle- and set out to make this cake (after I talked my mother in law [MIL] into buying the eggnog and bringing it to the house. Closest grocery store is 20mins in either of three directions from my house and I’d already placed my delivery order. I hate going to the grocery store. I only go to buy cake ingredients… that is the honest truth. Blue Apron is my life! Except it’s Christmas and I needed more stuff so I had the store deliver. No way I was going to deal with the masses to add to my stress.) While I waited on my MIL to get here I decided on a couple of things…first I was Definitely going to spike the eggnog. To this my hubby has declared I must have lost my damn mind for using his Xtra Mature rum to ‘experiment’ with. Lol. He’ll be okay. Secondly, I had to figure out how to cut down on the sugar as I really want to eat an actual slice of this cake 🍰. Next, the simple syrup would be reduced to simply rum…yup. And lastly, I was going to make the chai spiced latte cake but replace the milk in that recipe with the eggnog in this one and reduce the cardamom (which I think I may have doubled when I made that cake). Oh Liv…oh look at that, almost sounds like Olivia…haha…I promise to follow at least one recipe as written next year. I always increase the amount as it never fills my three 6″ pans and I also sometimes make two 9″ and slice them. I usually have to play with the sugar too, I don’t like sugar 😝. I will also start writing down what I actually end up doing because I can never replicate anything. So I will combine these two cake recipes and then I’ll send pics…yes I always say that and never do. Thankfully my hubby has been doing a good job of taking pics. Have a Merry Christmas and thanks for helping me save face and not have to call my cake lady after having to tell her I never cared about how her cakes tasted since I’d never eaten any of them. I now get to Liv 😉through you and make cakes that I know taste good- I’ve never had a slice of any of these either but I do sample somehow. Oh My Holiday! As a Pastry Chef I love finding recipes from scratch that actually turn out. And this one is amazing! I doubled it and used 8in rounds because I have a larger party to serve but I’m super impressed with this. 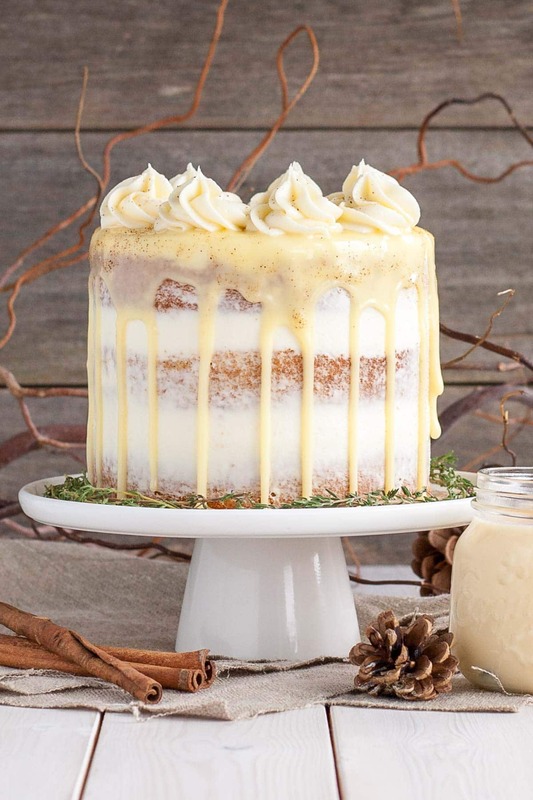 I love eggnog and the flavor combinations are perfect in the cake. Thanks for sharing! I’ll be keeping this one for sure! Thanks so much Michelle! I’m so glad you liked this one as it’s one of my faves!! I may have missed this in the above Q&A, but I only have two 8 inch round pans. Will that change the recipe? Thanks! Hi Brooke! Two 8″ pans will work just fine with the recipe as is. Your layers might be a bit thinner though (so you may need to adjust baking time). If you want you can 1.5x the recipe to ensure tall layers, but make sure you don’t fill your pans more than 2/3rds full. You can make cupcakes with any excess batter. Yay! So glad you liked this one and I hope you liked the vanilla one too!! I am planning on making this for Christmas this year, but I am super busy and don’t think I’ll have time to make it fresh. Can it be made two days ahead of time? And if so, store in fridge or room temp? Thank you! Hi Jennifer! I would store it in the fridge and bring it to room temperature before serving. Just note that the fridge tends to dry cakes out though, so ideally you’d only refrigerate the day before. Two days in advance won’t be a huge detriment though 🙂 Let me know how you like it! I only have 9in cake pans. I’m new at baking. I’m assuming I will have to add extra of everything? Hi Becca! I would 2x the recipe and use it in two 9″ pans. Be sure to not fill the pans more than 2/3rds full. Can you use a vanilla simple syrup? I was hoping to make this in cupcake form for a party (easier to eat) – – do you recommend any alterations for that? Hi Heather! This will totally work as cupcakes. Bake at the same temp, but check them at 15mins or so. Let me know how they turn out! Made this cake and it was DIVINE!!! I was worried about the ganache because I don’t really like white chocolate, but it worked well. I also used eggnog instead of cream for the ganache so that might have made a difference. Will be making it for Christmas for sure. Hello, what kind of rum do you suggest for this? Hi Parris!! I’m not an expert on rum so I’d say use any kind that is your favourite. I uses Appleton Estate Signature Blend. I see 6″ cake pans for sale that are either x 2″ or x 3″ Do you recommend one over the other? Hi Caitlin! Either will work just fine 🙂 I have the 2″ high ones, but sometimes wish I had the 3″ ones as some of my layers can bake up a bit tall. This cake recipe works perfectly in 2″ ones though. Made this at Christmas and it was the talk of the party! So good!!! This cake was really yummy – I tried it out this Christmas as my family usually wants the same coconut cake and I refused 🙂 I only had 8″ and 9″ pans though so I think I should have adjusted the baking time a bit. But otherwise they came out great. I may try to make it one more time before winter ends. I absolutely despise cream cheese anything! Do you have a substitute frosting recipe you can suggest 😀😀? I tried this recipe but 11/2 cups of flour is not enough batter to make this cake the layers were too thin looked nothing like you picture. Hi Frances, sorry this didn’t work out for you. 1 and 1/2 cups flour is the correct amount and works perfectly for this cake. This is actually the same recipe (with slight modifications) that I use for all of my 6″ cakes. They layers should be between 1″ and 1.5″ thick (that’s the size of the ones pictured). If they were flatter than that then perhaps your baking powder was expired or the batter was over-mixed. I’m about to make this recipe (looks amazing) but wanted to make sure that you really mean to use a 6″ cake tin. No local stores have one and it looks like I’d have to order from restaurant website. Is it supposed to be 9″ cake tin? Hi Deena! I use 6″ cake rounds for most of my cakes. If you have 9″ cake tins only then I would recommend doubling the recipe and using 2 tins. I hope that helps! 1) How will I know/avoid overmixing the cake batter? 2) I have an old fashioned hand mixer, will that be okay to use? I’m trying to think if adding the nutmeg might just give it little specks (or if they would somewhat dissolve and actually change the color of the icing at all). I’m thinking of using this icing recipe because I like the consistency and specifically need something WHITE. But also want to add the nutmeg. Thoughts? Hi Alisha! Nutmeg “should” just give it little specks, but it will affect how white the frosting comes across overall. If you want a pure white, I’d skip the nutmeg. You could always sprinkle a little nutmeg between the layers of frosting to add additional flavour. Let me know how it turns out! Just made this cake and it was absolutely delish! I honestly didn’t think that I could pull it off. Was pleasantly surprised at both how pretty it turned out and how flavorful! Everyone really enjoyed it. I was hesitant to use all of the rum simple syrup because I thought that it would be too wet. In the end, I used most of it and it was perfect. Hi Tracy! I’m so glad you liked it 😀 And ack, I didn’t intend for you to use all of the syrup — I’ll clarify that in the recipe. It’s supposed to be just enough to moisten the cake. I’m glad it worked out for you!! I made this cake exactly the way the recipe is written and my cakes are flat and thin. They didn’t rise and get fluffy at all. Very disappointed. Even the batter was thick and not able to be poured into the cake pans. Something seems like it’s missing. The batter is pretty thick so you’ll need to spread it out. They layers themselves should be between 1″ to 1.5″ tall, if they’re not then I suspect the culprit may have been expired baking powder. It still seems moist and all, so I managed to cut it in half to try making the cake a bit taller with more layers. I had the same thing. There was not enough flour or baking powder. My layers were extremely dry. 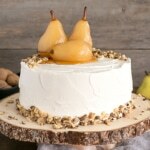 I’m planning on making this cake for my grandma’s birthday this weekend. I have a couple of questions though. I’ve got two 7 1/4 inch cake tins, would you recommend making two bigger or three smaller layers? Ideally I’d like the cake to be three layers, but I’m not sure if the consistency of the cake can handle those thinner layers (e.g. they won’t break on me). Also, is the eggnog you’re using alcoholic? Because our Dutch eggnog (advocaat) is 14% vol. and I hope it won’t affect the cake too much if yours is non-alcoholic. Advocaat is also bright yellow and I quite like that, so I’ll definitely try using it in the ganache! Any tips? Or just add it bit by bit to the chocolate until it reaches a nice consistency? Hi Diane! If you’ve only got two cake tins, I’d recommend just baking two layers, unless you plan to make the cake batter twice. I would use the recipe as is in your 7 1/4″ pans — the layers will bake up taller than mine and you can always cut them in half to get 4 layers, maybe? Just a thought. I ended up making two layers, because it seemed like there wasn’t gonna be enough batter for three layers. Panicked a bit, but they rose very well. Couldn’t really cut them in half, because they were domed (in spite of having used DIY bake even strips, so maybe I’ll buy proper ones next time 😛 ). Panicked a bit more when they felt rather hard and dry once cooled, but I’ve covered and chilled them overnight, and they were supermoist and all sticky the next day, so crisis averted! The alcohol from the advocaat mostly evaporated during baking, I think. But I’ve made the ganache with advocaat and it was pretty darn good! Melted the chocolate first, mixed in 1 tablespoon of milk (didn’t have cream haha) and then added 5 teaspoons of the eggnog. Advocaat is quite gloopy, so it had the right consistency to make the drips straight away. This cake is beautiful! I plan on making this for Christmas. My question, however, has nothing to do with the recipe. Can you tell me the name of the maker and pattern of the dish you have the slice of cake sitting on? It’s white with an embossed pine cone and berries. It’s beautiful! Hi Quintin! Thank you!! I actually got the plate at Superstore 😊 A Canadian grocery store. Hi there, a quick question. I’m no baker so as dumb as this sounds…do you grease and flour pan then put parchment paper over that? Hi Christina! Not dumb at all 🙂 I grease and flour (well, I use Pam for Baking because I’m lazy) and then line just the bottoms with parchment. Helps ensure the cakes come out of the pan cleanly. I use the cake pan to trace circles on the parchment and then cut them out. If you were to use rum extract instead of rum, do you know if it would be the same measurement? Hi Tiffany! You would want to reduce the amount as it’s more concentrated. I would say no more than half the amount listed. I don’t see where the rum simple syrup is used? Hi Mary! It’s in step #8 of the cake instructions. This is beautiful! 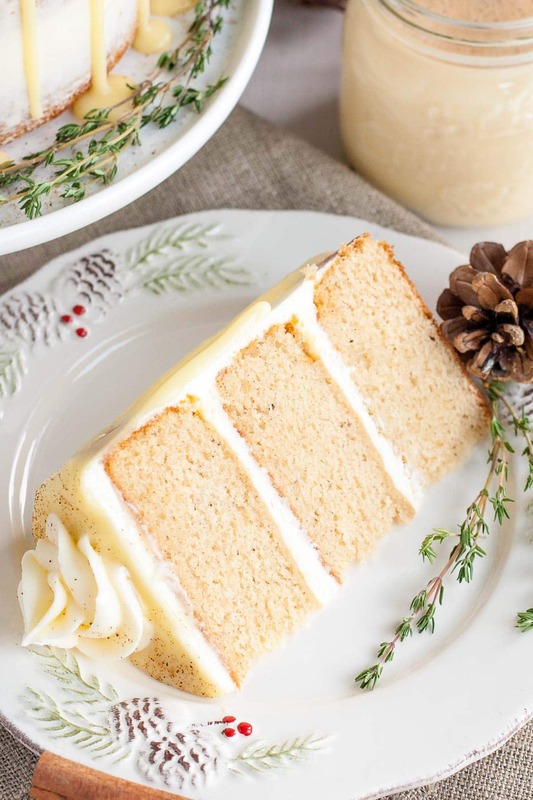 This just might make it onto our Christmas Day dinner table…do you serve this cake chilled or at room temperature? Thanks Tracy! Room temp is best. I hope you like it!! I love what you do with cakes!!! They are breathtakingly beautiful and such an inspiration to me. I always enjoy seeing what’s new!! I love all the Christmas movies but my favorite has to be It’s A Wonderful Life. Happy Holidays to you and your family. Thanks so much Lynn! It’s A Wonderful Life is a good one 🙂 Happy Holidays back at you!! I think my fave Christmas movie of all time has to be It’s A Wonderful Life, Olivia. I can quote far too many of the lines and I keep a box of tissues handy. Necessary. So we put up our tree last night, and maybe we’ll watch a fun Christmas movie tonight. You’ve inspired me. And now I need this cake to go with. So pretty and classic — eggnog is a holiday treat, and we’ve already gone through a carton at our house. But this cake! And glaze. Fabulous. Aww It’s A Wonderful Life is a classic for sure. I can’t help but flip over to it if I see that it’s on tv!